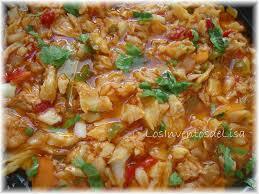 Bacalao Guisado (Salted Codfish Stew) - Tienditadepuertorico.com - Buy Puertorican Food Here!! Add sofrito, tomatoes, and tomato sauce. Cook over medium heat 5 minutes. Add remaining ingredients and cook over low heat for 15 minutes.